How do evolutionary theorists understand altruism? Altruism, which involves helping others at some cost to the self, has long been a puzzle to evolutionary theorists. How is altruistic behavior evolutionarily adaptive? It is certainly common enough in the animal world. Worker bees and drones live their entire lives in service to the queen bee. They do not even reproduce. Alarm calls are also altruistic. When an animal sounds the alarm, warning others of the presence of a predator, the animal increases its visibility to the very predator it is warning against. Likewise, altruistic behavior is widespread in human beings. We give money to charity, take care of other people’s children, and may even donate a kidney to a relative in need. Although altruistic behavior may cost the individual animal, it may still confer reproductive success if it helps other animals that share the same genes. Thus, we would expect altruistic behavior to be most common among close relatives, which is universally the case. What is also found is that the cost and risk of altruistic behavior decreases as the biological relationship grows more distant. Think about it. Most of us are willing to donate used clothes to children in another country. This is a low cost and low risk investment. But would you be willing to sell your house and donate the proceeds to a complete stranger? Would you be willing to donate a kidney to a stranger? Or would you be more likely to donate your kidney to your sister, especially if she was likely to die without it? 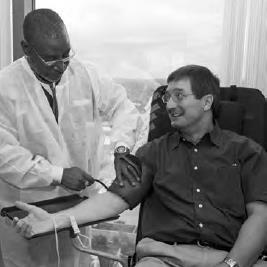 Helping others when it in no way benefits oneself—such as donating blood—is called altruism. Scientists, believing that evolution has been based on self-preservation, have long wondered what the advantages could be of altruism (iStock).